May 4, 2018: Shibori/Tokkuri Japan & Wearable Art: Impact on Gallery Textile Artists. Shibori Artists: Betsy Giberson, Ana Lisa Hedstrom, Mary Jaeger and Carol Lee Shanks. Ceramic artists: Judith Duff, Anthony Gaudino, Robin Hominiuk, Mitch Iburg, Shiho Kanzaki, Lucien Koonce, Ken Pincus, Akira Satake and Reid Schoonover. April 6-30, 2018: Black White & Gray, continuing exhibition. Jan Branham, David Berger, Wendy Dunder, Pam Galvani, Gary Groves, Renee Jameson, Kathryn Lesh, Jacki Moseley, Ayan Rivera. Featuring the comtemporary Basketry of Dorothy McGuinness. First Friday Art Walk, April 6, 6-8PM. In concert: The Jenny Davis Jazz Duo. March 2, 2018. Black, White & Grey. February 2, 2018. The Jewelry of Agnes Seebass: A Modernist. Trained in Germany, France and Mexico, Seebass is inspired by the forms of nature and contrasts in Mexico yet is drawn to simple geometric shapes and a passion for precise handcraftsmanship. Trunk Show with Michelle Tange, First Friday Artwalk, February 2, 6-8pm, continuing February 3, 10am-5pm. Also: New Work from glass and metal artist KT Hancock. The artist conveys in her gem-shaped objects an idealized adornment piece for the body. Although not wearable, these objects reflect an inherent cultural, physical and sentimental value. Her new vases will also be shown. Continuing through February 28th. December 1-31: December 1-31, 15!, celebrating 15 years of collaboration with artists from near and far; All Gallery Artists show. November 3-30: Continuing Exhibition - Art for the Home. Fifteen of the Gallery’s artists exhibit new work – ceramics, furniture, prints and fiber sculpture – that both inspires and provides functionality for daily living. The Jenny Davis Duo plays for the first Friday Artwalk reception from 6-8 pm. October 6-31: Art for the Home. Fifteen of the Gallery’s artists exhibit new work – ceramics, furniture, prints and fiber sculpture – that both inspires and provides functionality for daily living. Ranger and the Re-Arrangers play gypsy jazz for the reception from 6-8 pm. September 1-30: Continuing Exhibition - Expanding Vistas: Jen Till. Featuring New Fall Arrivals: Wearable Art. Irene Yesley and Joseph Pentheroudakis: Between the Lines. Lighting Up Spring: Sculptural Illuminations by Sean Carleton, Wendy Dunder, and KT Hancock. One-of-a-kind sculptural illuminations that enhance daily living, made from wood and paper, steel and glass. Opening Reception with the Artists, First Friday, April 7, 6-8pm. In the Front Space: Introducing Meg Hartwell and her recent abstract monotypes. Budding Out: New Work by Gallery Artists. Reid Anderson, Dave Berfield, Sean Carleton, Michelle de la Vega, KT Hancock, Renee Jameson, Tom Johnson, David Kellum, Jeff Ludwig, Jacki Moseley, Joe O’Brien, Ken Pincus, Chris Thompson. Opening Reception with the Artists, First Friday, March 3, 6-8pm. The artist follows her own threads of inspiration to create a series of connecting mixed media works for the wall and simpatico clay renderings, using as her primary focus the eternal symbols of vitality and love. This collection invites the viewer to interact on a very personal level, using sight, touch, and each of our own sparks of recognition to discover the true shape of our own hearts. View related Cradled Hearts video. Beneath Still Waters: New Work from Eva Funderburgh. Bronze and wood fired ceramic sculptures, featuring the beloved whimsical forest and aquatic creatures for which this remarkable ceramic artist is best known. In the front gallery, 11th Annual Wearable Art Show, featuring textile and jewelry creations from our talented designers. Introducing Agnieszka Kulon from Kreatia, Chicago. Bologna Blues Series: Virginia Paquette. For a residency at the Conservatorio di Musica in Bologna this year, Virginia Paquette painted these mixed-media works as part of a collaboration with William O. Smith. They are her visual responses to his works of music, influenced by their years together in Italy. Paquette responds to Smith’s music with color, line, rhythm, gesture, and collage of found images salvaged from the streets of Italy. Gallery reception with the artist, First Friday, October 7, 6-8pm. William O. Smith, noted jazz clarinetist and composer, joins Anne Pell to celebrate the opening. Bainbridge Island’s Own Gypsy Jazz Band. Dialogues in Fiber. Suzanne Hubbard, Vashon Island, shows weavings from an ongoing series entitled Silent Oratory, a Weaver Speaks. The series explores weaving as language. Tom Johnson, Bainbridge, creates geometric fiber sculpture as wall pieces and furniture. Reception with the Artists, First Friday, July 1, 6-8 pm, featuring Jon Crane & Abraham Neuwelt Rainforest Journey in concert on the Plaza. Dialogues in Fiber. Suzanne Hubbard, Vashon Island, shows weavings from an ongoing series entitled Silent Oratory, a Weaver Speaks. The series explores weaving as language. Tom Johnson, Bainbridge, creates geometric fiber sculpture as wall pieces and furniture. Reception with the Artists, First Friday, June 3, 6-8 pm, featuring The Anne Pell Jazz Trio in concert on the Plaza. Artistic Exploration: Alternative Paths. Carol Fiedler Kawaguchi, Carl Yurdin and Lisa Wederquist. Carol pursues both traditional Asian screens and whimsical mirrors. Carl applies the art of industrial design to fine furniture. Lisa extends her minimal style from painting to ceramics. Reception with the Artists, First Friday, May 6, 6-8 pm, featuring Jon Crane and Abraham Neuwelt, Rainforest Journey in concert. Flower Arrangements by Michael Yu. Spring Flocks and Frocks - featuring Ashley Licht, Susan Petersen, Carol Lee Shanks, Sprinthouse, Christina Sundt, Diane Turner. Opening receiption April 1st, 6-8 pm. In Concert: Ranger and the Re-Arrangers, Bainbridge Island's Own Gypsy Jazz Band. Reflecting Nature's Moods, New work by Renee Jameson and Jen Till. Mini Show: Diane Reincke's Student Artists. February 5-28, 2016. Opening Receiption for the Artists: First Friday, February 5th, 6-8pm. In Concert: Ranger and the Re-Arrangers, Bainbridge Island's Own Gypsy Jazz Band. The Island Gallery Annual Sale. New work from Renee Jameson, Carol Fiedler Kawaguchi, Maggy Pavlou, Christine Sundt, Dave Thompson, and Lisa Wederquist. Introducing new artists Jeff Harmes, Marc Roux and Delores Fortuna. Special mid-century modern pair of leather and chrome chairs updated by Marcia Adams-Landry. Reception Friday, January 8, 6-8 pm. Annual Wearable Art Show. Wearable art pieces to celebrate the holidays! Artist designers: Carol Lee Shanks, Sandra Holzman, Katrin Noon for Spirithouse, Amy Nguyen, Maggy Pavlou, Carter Smith, Amy Brill, Virginia Paquette, Christine Sundt, Bara, Maria Chapin-Cao, Woodleigh Hubbard, Begona Rentero, Agnes Seabass, Red Lotus Collection, and Lou Zeldis Collection. Reception, First Friday, December 4, 6-8 pm, featuring holiday music. Wood Odysseys. Thoughtful and exciting works to enliven your home or work environment, from Northwest artists: Alan Vogel, Donald Smith, Nathan Christopher, Sean Carleton, David Kellum, Ted Scherrer, John Luke, Wendy Dunder, Carl Larson, Dave Thompson, Scott Trumbo and Tiplin Taylor. Reception with the Artists, First Friday, November 6, 6-8 pm. Irene Yesley: Patterns on Plexi, New Work. Award winning Bainbridge Island artist showcases her innovative work using acrylic, paint and paper on layers of Plexiglas. This process results in both visual and actual depth, inviting the viewer to walk into and explore each image. Reception with the Artist, First Friday, October 2, 6-8 pm, featuring Ranger & The Re-Arrangers. Fall Fashions. Featuring new work from Kay Chapman, Katrin Noon for Spirithouse, Rana Helmi, Sandra Holzman, Maggy Pavlou, Mary Jaeger and Carol Lee Shanks. Floralscapes: Sandy Haight. Watercolors by 2015 Bainbridge Island Garden Tour Poster Artist. Introducing Bainbridge artist Karen Chaussabel and her Harvest of the Heart series, studies of fruit and vegetables in delicate encaustic and ink. Opening Reception, Second Friday, July 10, 2015, 6-8 pm. The Julie Duke Band in concert on the Plaza. Gitana Spring Collection: Featuring New Work by Mexican jewelry artist Agnes Seebass. Trunk Show Friday, April 3, 6-8 pm and Saturday, April 4, 10am – 6 pm. Peter Spencer in concert First Friday Artwalk, 6-8 pm. Also featured in April: Indigo textiles by Roland and Chinami Ricketts; new wood sculpture by Alan Vogel and Nathan Christopher; and Lisa Wederquist paintings. Featuring ikats from the Gallery’s Collection of traditional Sumba Island ikats by noted Sumbanese weavers and a “magical” double ikat from Tenganan, Bali, with more contemporary designs from noted American textile artist Lou Zeldis, who also worked in Indonesia with Sumbanese weavers and dyers. Featuring New Wearable Art Arrivals from Maggy Pavlou ~ Roselle ~ Carol Lee Shanks ~ Katrin Noon for Spirithouse.Reception: First Friday, January 2nd, 6-8 pm. Reception: First Friday, December 5, 2014, 6-8pm. Reception: First Friday, November 7, 2014, 6-8pm. Introducing Santa Fe painter Lisa Wederquist and her nature inspired minimalist paintings on linen and paper. Reception: First Friday, October 3, 2014, 6-8pm. Music by Peter Spencer and Friends on the Plaza. Reception: First Friday, September 5, 2014, 6-8pm. Music by Ranger and the Re-Arrangers on the Plaza. New Work from Curt Labitzke. Hermine Pruzan Endowed Faculty Fellow and Chair of the Printmaking Program at the University of Washington School of Art, Curt Labitzke shows his latest work inspired by classic European painting and sculpture. Reception with the Artist: First Friday, August 1, 6-8PM. Introducing Bainbridge Island artist Renée Jameson, whose monotypes reflect summer’s color spectrum. Carter Smith: Shibori Master: July 11 – 27, 2014. Silk shibori banners and new fashions from one of America’s finest shibori artists. New Work from Virginia Paquette. Painter and teacher Virginia Paquette whose paintings and jewelry have long been featured at the Gallery shows her most recent mixed media, collages inspired from her annual sojourns in Italy with husband and musician, Bill Smith. Virginia is also known for her large public art sculptures shown throughout the State of Washington. Reception with the Artist: First Friday, June 6, 6-8PM. Bill Smith, clarinetist with the original Dave Brubeck Quartet and University of Washington professor emeritus of music, accompanies his wife’s artistry with improvisational jazz. Earth Elements. Featuring wood fired ceramics from Washington ceramist Robin Hominiuk whose work ranges from the artistic functional to organic sculptures and containers. Reception with the Artist: First Friday, May 2, 6-8PM. Please see Press Release. Western Landscapes. Featured artists include: Mark Bowles, William Thompson, Jen Till, Theodore Waddell, and Irene Yesley whose works depict life in the changing seasons of the Plains, the Palouse of Western Washington and Northwest, and color-drenched central California. Their styles move from representational to minimalist and abstraction. Reception with the Artists: First Friday, March 7, 6-8PM. Please see Press Release. For Your Valentine. Introducing Joel Sayre and his wood sculptures. Reception: First Friday, February 7, 6-8 PM. Please see Press Release. paintings, prints, textiles, and wood furniture & sculpture. 8th Annual Wearable Art Show. Opening First Friday, December 6, 6-8 pm with music by Peter Spencer & Friends. Holiday Tables. For you holiday entertaining, wood dining tables and everything that goes on and above – dishes, glassware, table linens, wood trays, centerpieces and exquisite lighting – from our talented artists. Opening First Friday, November 1, 6-8 pm with music by Peter Spencer & Friends. Eclectica. New furniture, paintings, glassware and wearable art from our talented artists. Introducing new textile artists, Northwesterner Bryan Johnson and Mary Jaeger from NYC. Opening First Friday, October 4, 6-8pm with music by Peter Spencer & Friends. Northwest sculptors Nathan Christopher and Michelle de la Vega. Opening reception with the artists, First Friday, September 6, 6-8 pm. Music by Peter Spencer & Friends. North by Northwest: Paintings by Kathleen Faulkner. This Anacortes artist paints her environment, landscapes, and its creatures, undeniably personal and familiar to her as a lifelong resident of the Northwest, displaying a gauzy technique that evokes our area's own misty backdrop. Opening reception with the artist, First Friday, August 2, 2013, 6-8 pm. Music by Ranger and The Re-Arrangers on the plaza in front of the gallery. Show runs August 2 - 30, 2013. Sizzling Summer: Ceramic Sale. Purchase the work of well-known wood fire ceramic artists rarely on sale and welcome new artist Martha Reisdorf from Gig Harbor who paints in an abstract impressionist style. Reception with the artists First Friday, July 5, 2013, 6-8 pm. Celebrate the month's festivities and rock with The Julie Duke Band and Peter Spencer on the plaza in front of the gallery; Julie Duke's band delivers an edgy, unrestrained blend of Blues from the Delta to Chicago. Solstice Faire. June 7-30, 2013. New work from Maria Chapin-Cao, Robin Hominiuk, John Luke, Reid Schoonover, Carol Lee Shanks, Carter Smith, Robert Spangler, Jen Till, Irene Yesley, and Anna Whitmore. Opening Reception, First Friday, June 7, 2013, 6-8 pm. Music by The BBC. Symbols of Nature & Man: A Journey of 40,000 Years. April 26-May 24, 2013. World renowned textile artists Nia Fliam and Augus Ismoyo, in an exhibition at the Textile Museum (Washington DC) opening in April, come to Bainbridge Island. These artists demonstrate how contemporary artists are preserving the traditional arts while interpreting them in new and innovative ways. Their show opens on Bainbridge Friday, April 26 and runs through Friday, May 24. Please join the artists for a special reception on Friday, May 10, 6-8 pm. Awakenings. Oil paintings by Bainbridge Island artist Jen Till. April 5-21, 2013. Opening reception with the artist, First Friday, April 5, 6-8 pm. Music by Peter Spencer & Friends. Bonnets, Baskets & Beads. Featuring new work from Carol Campbell, Doriane Nieburgs, Virginia Paquette and Christine Sundt. First Friday Gallery Reception, March 1, 6-8 pm. Gallerywide Sale. First Friday, Gallery Reception, January 4, 2013, 6-8 pm. Music to be announced. Sale runs January 2-31, 2013. November 2012. Moving Forward” Opening reception, Friday, November 2, 6-8 pm. See the press release page. Fall De"Lights," September 7-30, 2012. Featuring gallery artists: Wendy Dunder, Maggy Pavlou, Carol Lee Shanks, Giselle Shepatin, Lou Zeldis and Bara. Introducing Carl Larson (lamps), Kiss of the Wolf, South Palace and Neo (wearable art). Northwest ceramic artists Jenny Andersen & Steve Sauer exhibit new work, including sculptural and functional pieces. Reception for the Artists, Friday, August 3, 2012, 6-8 pm. Music on the Plaza in front of the Gallery. July 6-29, 2012, 6-8 pm. The Julie Duke Band plays Blues, Classic Soul, Funk and Rock on the Plaza in front of the Gallery. See the press release page. We are pleased to continue our exhibit of Wendy Dunder Sculptural Illuminations during the month of July. June 2012: Sculptural Illuminations by Wendy Dunder. Opening First Friday Arts Walk, June 1, 2012. Music by The BBC on the Plaza. See the press release page. May 2012: Card Art by Sue Petersen of Bainbrige Island. Opening First Friday Arts Walk, May 4, 2012. Ranger & The Re-Arrangers play gypsy jazz on the Plaza. See the press release page. April 2012. Spring Collections: Home Décor & Wearable Art. New wood fired ceramic work from the 51st Firing of the Santatsugama Kiln in Seabeck, WA. Organic wood furniture & sculpture from area artists. 2012 collections of hand dyed & painted linen wearables from Chrzaszcz and new paper jewelry creations from Begona Rentero. First Friday Opening, April 6, 2012, 6-8 pm. Exhibition runs April 6-29, 2012. See the press release page. March-April 2012: NCECA (National Council on Education for the Ceramic Arts) Exhibition at The Island Gallery: John Neely & Dan Murphy (Utah State University Faculty). March-April 2012. Receptions, First Friday Arts Walk, March 2, 6-8 pm and Sunday, March 25, 1-5 pm. Date for Reception and Discussion with the Artists during last week of March, to be announced. See the press release page. January 28, 2012. For immediate release. November 25, 2011. For immediate release. October 28, 2011. For immediate release. September 30, 2011. For immediate release. July 29, 2011. For immediate release. Event: Fashion: Still Life/In Motion. Pamela Dharamsey Lee: Art, Dance & Gallery Fashions. June 24, 2011. For immediate release. Event: Toast Winslow! Ceramic & Glass Drinking Vessels by Gallery artists. May 27, 2011. For immediate release. April 29, 2011. For immediate release. Event: Spring Selections: Art & Music with the Gallery Artists. March 25, 2011. For immediate release. 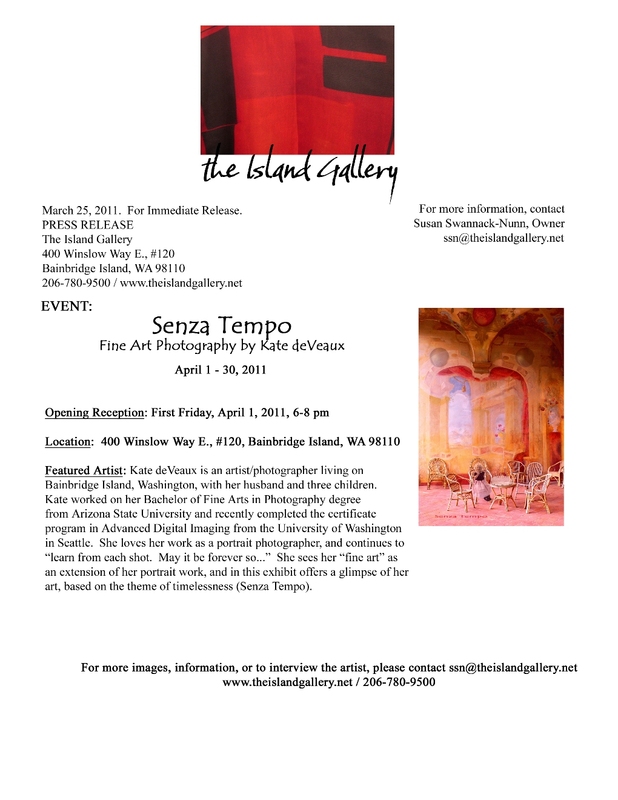 Event: Senza Tempo:Fine Art Photography by Kate deVeaux. March 2, 2011. For immediate release. November 25, 2010. For immediate release. October 18, 2010. For immediate release. September 21, 2010. For immediate release. October 21, 2009. For immediate release. January 29, 2009. For immediate release. January 16, 2009. For immediate release. Event: 4th Annual Bainbridge Island Pro-Am Bread Pudding Bake-Off! Date: First Friday, February 6, 2009, 6-8 p.m.
November 21, 2008. For immediate release. November 14, 2008. For immediate release. Date: Friday, November 28, 2008, 8:00 p.m.
September, 2008. For immediate release. Featured Performers : The Geordie Kelly Jazz Quartet. Performance Date: Saturday, July 19 at 7:30 p.m. The Island Gallery introduces its new Summer Jazz Series with the first of five evenings of smooth, hot jazz. Seating is limited. Reservations are recommended. Please contact The Island Gallery: (206) 780-9500. Featured Performers : Ranger and the Re-Arrangers. Performance Date: Saturday, July 12 at 7:30 p.m. The Island Gallery introduces its new Summer Jazz Series with the second of five evenings of smooth, hot jazz. Seating is limited. Reservations are recommended. Please contact The Island Gallery: (206) 780-9500. Performance Date: Friday, June 6th at 8:00 p.m. Performance Date: Saturday, May 17th at 7:30 p.m.
April 18, 2008. For immediate release. Also Featuring: "The Daily Drawings." Greg MacDonald. Opening Reception: First Friday, May 2, 2008, 6-8 p.m.
Artists: Rachel Pearson & Stephen Bryant, violins; John Scanlon & Sue Jane Bryant, violas; Richard Treat, cello. Performance Date: Friday, April 25, 7:30 p.m. Enjoy an evening of chamber music and extraordinary art. Admission is $20/$10 advance or at the door. Seating is limited to 60. 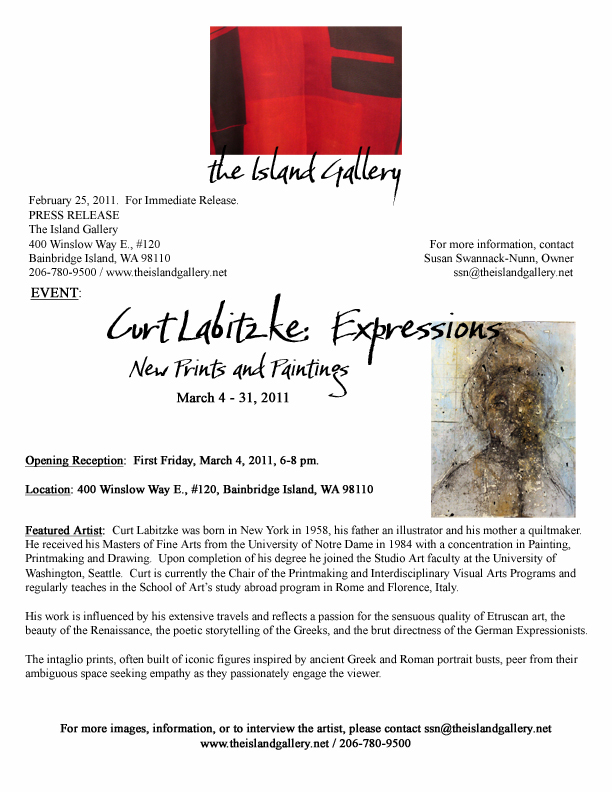 For advance purchase contact The Island Gallery: (206) 780-9500. Artists: Laura De Luca, clarinet; Ben Hausmann, oboe; Stephen Bryant, violin, Sue Jane Bryant, viola; Joe Kaufmann, bass. Opening Reception: First Friday, April 4, 2008, 6-8 p.m.
March 7, 2008. For immediate release. Performance Date: Friday, March 28, 7:30 p.m.
February 5, 2008. For immediate release. Exhibition and Event: BAINBRIDGE ISLAND�S 3RD ANNUAL BREAD PUDDING BAKE-OFF ANOTHER SWEET (AND SAVORY) SUCCESS! Exhibition Dates: February 1, 2008, 6-8 p.m. Performance Dates: Friday, February 15, 7:30pm; Friday, March 28, 7:30 p.m.; Friday, April 25, 7:30 p.m.
November 23, 2007. For immediate release. Opening Reception: First Friday, December 7, 6-8 p.m.
October 26, 2007. For immediate release. Opening Reception: First Friday, November 2, 6-8 p.m.
September 27, 2007. For immediate release. July 23, 2007. For immediate release. May 18, 2007. For immediate release. Artists:Jenny Andersen, John Benn, Richard Bresnahan, Granite Calimpong, Barb Campbell, John Dix, Jiri Duchek, Gina Freuen, Eva Funderburgh, Colleen Gallagher, Damian Grava, Nancy Gill, Eric Gorder, John Harris, Chuck Hindes, Shiho Kanzaki, Chris Knapp, Ken Lundemo, Jan McKeachie-Johnston, Sequoia Miller, Gavin Noyes, Hiroshi Ogawa, Peter Olsen, Owen Rye, Beverly Saito, Steve Sauer, Al Tennant, Jack Walsh, Natalie Warrens, Ben Waterman, Rigel Weis. Opening Reception: First Friday, June 1, 6-8 p.m.
April 6, 2007. For immediate release. Exhibition Dates: Friday, April 20, 7:30 p.m.; Friday, May 25, 7:30 p.m. Enjoy an evening of chamber music and extraordinary art. Admission is $15/$5 students at the door, or for advance purchase contact The Island Gallery: (206) 780-9500. January 19, 2007. For immediate release. November 24, 2006. For immediate release. And introducing the three dimensional fiber sculpture of Regina Benson. Exhibition Dates: December 1-31, 2006. Opening Reception and Fashion Show: Friday, December 1, 6-8 p.m.
July 31, 2006. For immediate release. May 2, 2006. For immediate release. Opening Reception: Friday, May 5, 6-8 p.m.
Woodworking Demonstration: Keith Mesirow, Arts Walk, Sunday, May 7, 1-3 p.m.
March 30, 2006. For immediate release. Exhibition: In The Garden: Wood, Stone & Ceramic Art For Outdoor Living. Ken Lundemo, Steve Sauer, Gregory Glynn, Gavin Noyes and . Exhibition Dates: April 7-30, 2006. Opening Reception: Friday, April 7, 6-8 p.m.
Here�s the winning bread pudding recipe! November 27, 2005. For immediate release. Exhibition: ALL THAT GLITTERS: Contemporary Wearable Art. Jewelry & Clothing Treasures from the Studios of Northwest & Pacific Rim Artists. Opening Reception: Opening Reception and Fashion Show with Music by Alaina Simcoe: Friday, December 2, 6-8 p.m. A portion of the proceeds will benefit Helpline House. October 28, 2005. For immediate release. Reception to Meet the Artist: Friday, November 4, 6-8 p.m.
September 19, 2005. For immediate release. Reception to Meet the Artist: Friday, September 30, 2005, 6-8 p.m.
July 10, 2005. For immediate release. Exhibition: CELEBRATION OF BATIK: THE ARTISTRY OF AGUS ISMOYO AND NIA FLIAM. INSTITUTE FOR CROSS CULTURAL ART SPONSORS FIRST ACTIVITIES. Indonesian and Salish Artists Collaborate. July 5-12. January 25, 2005. For immediate release. September 14, 2004. For immediate release. Exhibition & Jazz Performance: Virginia Paquette: FOREIGN BODIES, Bead Constructions and Paintings of Found Images from Italy, with Bill Smith, jazz performer and composer. August 31, 2004. For immediate release.